Habitat’s Home Preservation repairs, replaces and rejuvenates local homeowner properties. 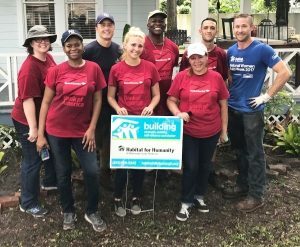 Habitat Hillsborough’s helping hands have been busy swinging hammers, paint brushes and rakes this summer to assist our Home Preservation Program (HPP) in tackling much needed maintenance for two local homeowners. 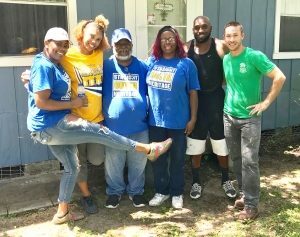 In mid July, our HPP staff and several volunteers helped the Duggan family restore damaged and dilapidated areas of their Thonotosassa home. Mrs. Duggan is physically disabled and her husband is her primary caretaker. They live on a fixed income and requested assistance in fixing damaged T1-11 siding on their home, painting, and replacing dilapidated front porch landing and steps. Thank you and three cheers for all the volunteers who helped us with these projects! And best wishes to the Duggan and Scott families as they enjoy the enhancements to their property these generous volunteers helped make possible. Are you a homeowner eligible for our HPP services? If you currently own a home that needs minor repairs and exterior enhancement, you may be eligible for the Home Preservation Program. 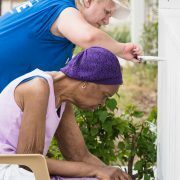 We offer this program to qualified limited income homeowners in Hillsborough County who are willing to partner with us, through sweat equity, to improve their home’s exterior presentation and durability. Eligible repairs include pressure washing, scraping, caulking, painting, minor soffit/fascia repair, yard clean-up, additional landscaping, porch repairs and accessible ramps. Through the support of our generous partners and volunteers, we are able to provide these materials and services at a fraction of the cost to the homeowner. Click here to visit our HPP page for more program details. 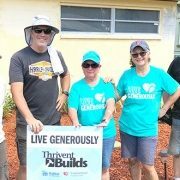 https://www.habitathillsborough.org/wp-content/uploads/2018/07/Blog-page-HPP-Rejuvenate.jpg 330 780 Robin Macar https://www.habitathillsborough.org/wp-content/uploads/2016/03/Horizontal-logo-2color.jpg Robin Macar2018-07-26 17:44:572018-07-27 13:50:32Habitat's Home Preservation repairs, replaces and rejuvenates local homeowner properties. 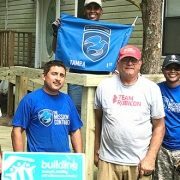 Habitat Hillsborough Homeowner Opportunity Initial Application Process Seeking volunteers and sponsors for Habitat Hillsborough Veterans Build!